This post tells you what is Documents and Data on iPhone Storage, and offers you two free ways to delete app documents and data on your iPhone X/8/7/6/6s/5/5s/5c/4s/SE and even the new iPhone XR/XS (Max). Want to manage all data and documents on iPhone 7/8/X/XR/XS? This article is intended to show you two ways to delete documents and data on iPhone easily. When you check storage on iPhone 6 or other iOS device by going to “Settings > General > Storage > Manage Storage”, you may find some large apps. And if you continually tap into one of these apps, you may find the huge “Documents & Data” items are the culprits eating the limited room on your device. You may have decided to remove “Documents & Data” to free up your iPhone space but you couldn’t because all of these items are greyed and can’t be clicked. 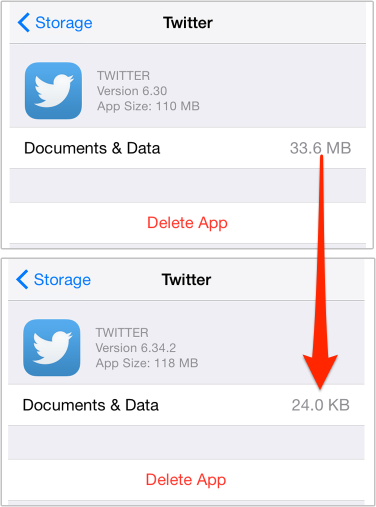 So, what is Documents and Data on iPhone/iPad and how to delete them to free up storage space? When you use 3rd party apps in iOS 8/9/10/11 or iOS 12, some extra data (such as logs info, cookies, caches or downloaded images and videos) will be created by the app and stored in its Documents and Data folder on your iPhone iPad. For example, when you run Snapchat on iPhone 6s and type your username and password to login Snapchat, the Snapchat icon and the texts you typed will be stored in the “Documents and Data” in your Snapchat app folder, which will take up space on your iPhone 6s. Therefore, if one third-party App created so many large files and cache data, its “documents and data” could be large, too, applies to any iOS device you are using, whether an iPhone 6/6s/7/8/X/XR/XS or iPad Air/Mini. Whether you are using old iPhone 4s/5s/6s/7/8/X or brand-new iPhone XR/XS in new iOS 12, removing iPhone “Document and Data” is quite easy. There are two free methods: manually clear caches and history by logging the app, or simply delete and reinstall the app. Method 1. Open your app and try to find the related item/setting to free up “Document & Data” folder. You might have found that you couldn’t clear the “Document & Data” item by tapping into Setting > General > Usage > Manage Storage (Storage) > App Name. However, you can try to log in related apps and clean your apps’ downloaded files, chatting history, media files, recording and so on to free up “Document & data”. For example, you can go to Facebook to remove browsing data, or login YouTube to delete watch history and search history. Method 2. You can completely delete “Document and Data” by uninstalling and reinstalling your app. If the first solution doesn’t work, maybe you can try this method to get rid of all the junk and caches in your App “Documents and Data” folder. We have tested this method by uninstalling Twitter and then reinstalling it. And the result shows the “Document & Data” files decreasing from 33.6 MB to 24.0 KB (0.023 MB) – Almost 0 MB. And the 24.0 KB could be Twitter login info. You may know what is Documents and Data on iPhone/iPad and how to delete them now. But this is just one aspect of cleaning and organizing your iOS devices. If you want to free up iPhone storage and delete other files or junks, you are suggested to use some professional iOS cleaning tools like PhoneClean.